He might be the "Strikeout King," but the 2017 Funko Pop King Felix Hernandez figures are a home run (pun intended)! The special stadium giveaway features a trio of options for the Seattle Mariners' pitcher. Fans at Safeco Field may have expected a single Funko Pop King Felix Hernandez figure, but a few were in for a treat as two additional vinyl figures were produced, albeit, in very limited numbers. 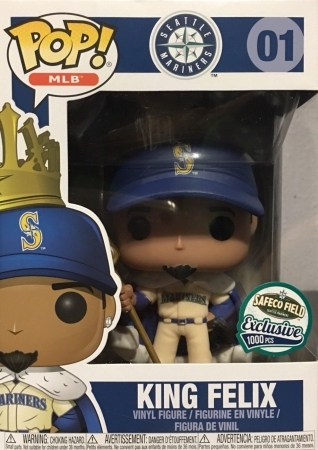 Each King Felix SGA option features him wearing a royal robe and a gold crown on top of his Mariners hat. Hernandez also stands on a slightly rounded disc that resembles the mound as he holds a scepter, which of course has a baseball in place of a jewel. Shop for Funko King Felix Figures on eBay. 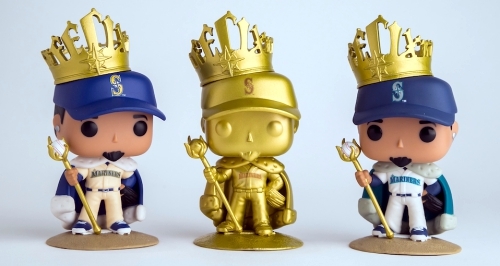 Although every Funko Pop King Felix Hernandez dons the same "royal" attire, the base figure wears the Seattle Mariners white home jersey, while the variant rocks the alternate home uniform, which is more of a cream color. Oh, you wanted to know about that other "rare" variant? The King Felix gold variant is limited to the same number Hernández wears on his jersey: 34. That is correct, only 34 were produced, and if you are hoping to chase one down, collectors can expect to pay hundreds of dollars, if not more. 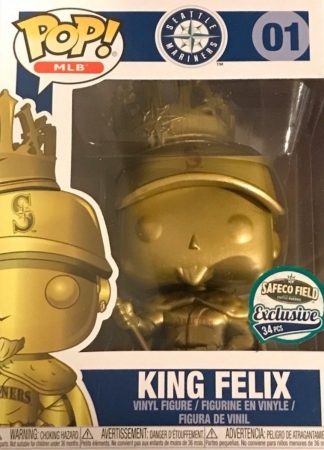 Soon after release, a Funko Pop King Felix gold variant sold on eBay for a whopping $1,275. 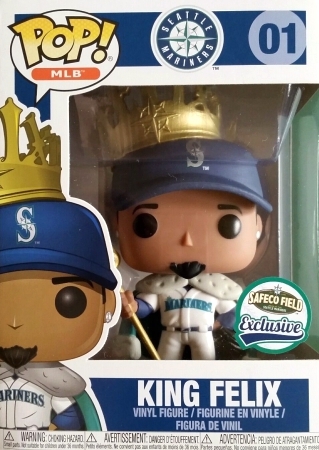 Despite the fact that the 2014 Funko Pop MLB Mascots line begins with #01, the Funko Pop King Felix box is also labeled Pop! MLB with King Felix in the leadoff spot (#01). This could indicate more players are coming in a new MLB series, however, this has not yet been confirmed. All three 2017 Funko Pop King Felix vinyls were issued at the September 23 game between the Mariners and Cleveland Indians as a stadium giveaway. Funko Pop GRAIL King Felix Hernandez Gold LE 34 Best Price! Free Shipping! Funko Pop MEGA GRAIL King Felix Hernandez Gold LE 34 Best Price! Free Shipping!